From the creators of Dancing Line comes a one-touch arcade music game, Dancing Ball! Featuring a distinctive soundtrack, and design, each level is a unique musical journey and challenge! 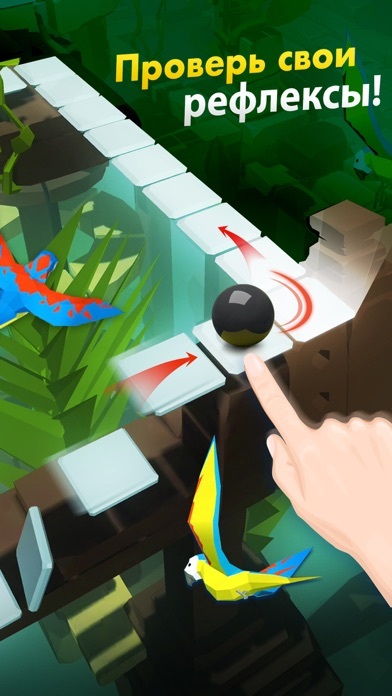 GAME FEATURES: - Multiple levels – each with an original musical piece and atmosphere - Addicting rhythm-based gameplay – listen to the music, tap to avoid obstacles! - Exciting original soundtrack – discover catchy, memorable tunes - Play for the challenge or to relax – the first levels are a peaceful experience, the later ones require reflexes and skills! - Free to play – all of the levels and challenges are available through normal gameplay GAMEPLAY: Each level is a maze built before your eyes. To anticipate what’s coming next and be able to react to its twist and turns you have to listen carefully to the music. The rhythm of the melody is key to everything that happens in the game. 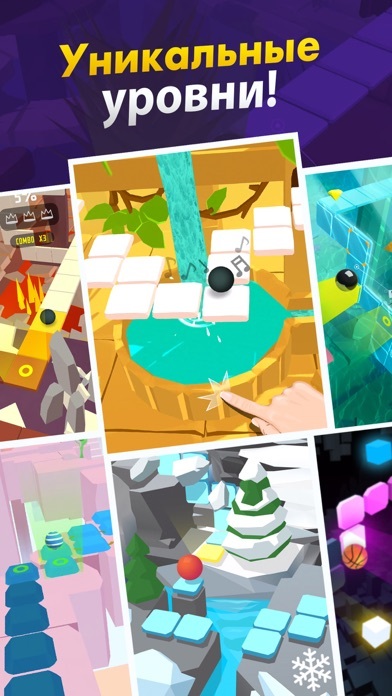 Levels are also designed to tell their own stories. Painted in a distinct graphical style, they allow you to visit and explore multiple different environments. Swim near the bottom of an ocean, fight for survival on a tropical island, take a tour of an ancient castle, navigating its walls and making sure not to hit the floor. Feel the Siberian climate of the Winter level. 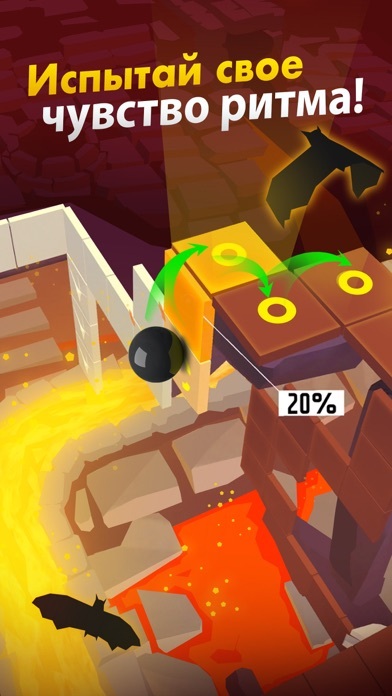 The later levels, where you get to venture into lava-filled tunnels and dangerous caves will be the ultimate test of your skills and reflexes! With time and training, you'll be able to crush all of them! LEVELS INCLUDE: - Ocean - Explore the vast underwater habitat teeming with colorful sea creatures - Island - Venture across a picturesque tropical island - Castle - Cross the drawbridge and attempt to crush the castle - Desert - Fight for survival in this sun-baked environment - Lava - Don’t fall. Remember - the floor is lava! - Winter - is coming! Be careful not to perish in the Siberian temperatures - Cave - Intense, fast-paced level. Can you escape the Cave? Use your reflexes and your sense of music to survive against impossible odds! 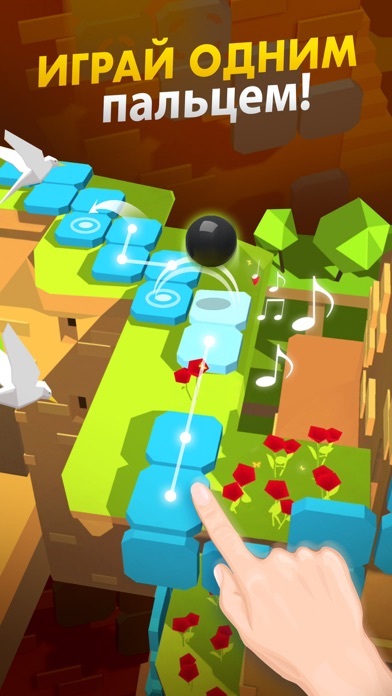 Dancing Ball is a game of surprising last moment jumps, excitement, and great music. Let it fascinate you! The in-game mission system exists to challenge you even after you complete all of the levels. You will want to come back and relive them, as you will be getting rewarded for doing so! Я не понимаю, как открыть новые уровни!!! Чтобы открыть уровень „Остров” нужны ключи, или что то ещё???? Как бесплатно достать ключи? Или можно без ключей разблокировать уровень? Пока не объясните мне, будет 4 звезды. Игра смешана с Роулинг скай и Линия танца. Эта игра для тех кто любит эти две игры сразу но не может выбрать какую скачать а эта игра очень классная игра крутая музыка. 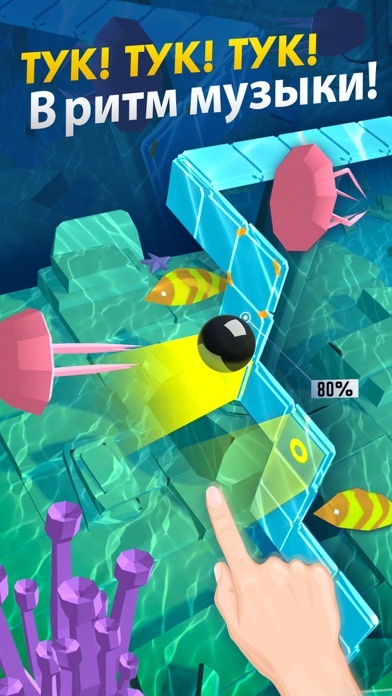 Вот игры «Rolling sky» и «Линия танца».